For those of you new to CCL: Who is this group who managed to get a powerful, fair, bipartisan climate change bill introduced by Republicans AND Democrats in Congress? For those of you who know us: Come learn more about our bill and how to get it passed! Come to Troy in March! The annual Citizens’ Climate Lobby (CCL) Northeast Regional Conference is a great opportunity for new and experienced CCL volunteers to learn, practice skills, connect with each other, inspire each other, and strategize how to move our country toward solving climate change. We now have a bill to support! The Energy Innovation & Carbon Dividend Act was introduced in both the House and Senate in 2018! CCL’s 100,000+ supporters were instrumental in the introduction of this first bipartisan carbon pricing bill in nearly a decade. This year, we’ll use our consistently respectful, nonpartisan approach and our shared values to make climate legislation this strong and fair a reality. Who: Whether you are new to CCL or a seasoned volunteer, you’ll find something to energize and inspire your climate change advocacy. 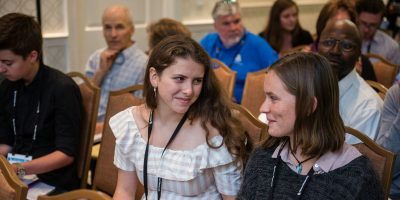 The Northeast Region covers New York, Connecticut, Massachusetts, Rhode Island, Maine, New Hampshire and Vermont, but all are welcome – and if you are the parent of a high schooler, bring them along! Maybe: How the Energy Innovation and Carbon Dividend Act would meet the IPCC’s recommended targets to stay below 1.5°C through 2040. What will your role be to move the bills forward? 12:00- 12:30 pm Wrap up and Happy Trails! Hats off to to Sage College’s Climate Crisis Center for co-sponsoring this event! We deeply appreciate this wonderful collaboration and in particular for Dr. Steven Leibo, Professor of International History and Politics at Sage as well as a commentator for WAMC Northeast Public Radio, for inviting CCL’s Northeast Regional Conference to Sage! Note: We set registration fee to cover our expenses, but we do not want cost of registration to prevent anyone from attending. Please contact Kelly Plessas at kmplessas@gmail.com if you would like to request a sliding scale. Limited number of discount rooms available at the Best Western Plus Franklin Square Inn, Troy. Room fee includes full breakfast buffet. Parking at Sage: Attendees will be provided with a parking pass for the weekend and map of campus. From I-90 W – Head northwest on I-90 W, Use right 2 lanes to merge onto I-87 N toward Saratoga, Use right 2 lanes to take exit 7 for NY-7 E toward Troy/Cohoes, Continue onto NY-7 E, Use 2nd from right lane to take exit toward Downtown Troy, keep left, follow signs for Downtown and merge onto 6th Ave, Continue on 6th Ave. Drive to 1st St.
Amtrak to Albany/Rensselaer. 20 minute drive to Troy. Best Western hotel provides pick-up from station. Minors (under 18) Registration: If you are under the age of 18, or are registering for someone under 18, a signed permission slip must be completed to attend the conference. Please email (kmplessas@gmail.com) for a permission slip. Minors must be accompanied by a parent/guardian or chaperone (who must also be registered for the conference).